The Shoal Creek armoire is a lovely addition nursery collection. 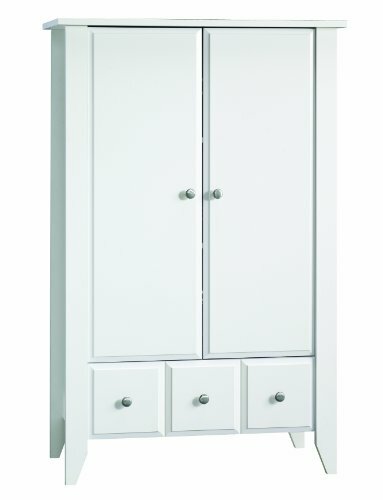 Armoire is large and sturdy and provides lots of storage. Includes two adjustable shelves behind doors. Drawers have metal runners and safety stops and feature patented T lock assembly system. Constructed from medium density fiberboard and particle board with laminate. Accented with solid wood detailing. Carton Dimensions: 6 1/8" H x 18 1/8" L x 59 3/4" W, weight: 128 pounds. Setup Dimensions: 54.25" H x 17.5" L x 34 5/8" W, weight: 120 pounds. Quick and easy assembly. Instructions and hardware included. 5 year warranty for defects in materials. Matte white finish.